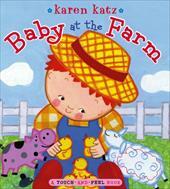 Karen Katz has written several baby friendly books that we enjoy. This one is a "touch and feel" book that Grace enjoyed exploring. The simple text is about a baby exploring a farm. Grace patted the different animals, exploring their different textures- the mane of horses, the wool of sheep, etc. This is a nice first farm book. We have owned this lift-the-flap book for a while and both Jonathan and Grace have enjoyed it very much. It's a lively story about a baby on a farm who just does not want to go to bed. The story is told in an engaging rhyme that will get your toes tapping: "While papa hauled the water/and momma cooked the chow/baby danced the cha cha/with the chocolate-colored cow". It's a fun, interactive book that both you and your children will love! This is another old favorite of ours. This board book is about some energetic toddlers exploring a barnyard. The toddlers are trying to figure out which animal says "boo!". 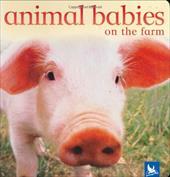 As they explore barns, fields and pastures, the children encounter different animals and the sounds they make. Jonathan enjoyed this book as a baby, and Grace seems to be interested as well. It's great for interaction- the children learn animal sounds and enjoy a bit of peek-a-boo at the end. Highly recommend! What's not to love about a Sandra Boynton book? 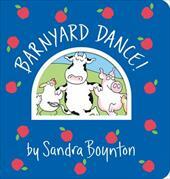 This lively board book encourages your toddler to get up and square dance with the barnyard animals! Dancing cows, twirling pigs fill the pages of this silly book. It's been a great one for teaching Jonathan how to move and dance like the animals. Boynton's text is very vibrant and fun-- you can't go wrong with this one! This cute board book is a guessing game. The first page gives an animal sound and a clue and then asks "Who is my mommy? "The next page reveals the mommy and gives the name of the baby: "My mommy is a pig. I am her piglet" Grace liked looking at the pictures of the animals while Jonathan enjoyed the guessing game. It's another fun board book.